LeSage Natural | A division of Green Acres Regional Center | Award-winning West Virginia Water Delivered to You! 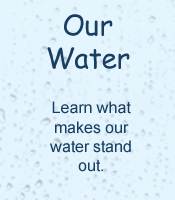 We Are More Than Just Great Water! Welcome to the nonprofit Green Acres Regional Center, Inc., home of award-winning LeSage Natural water! We are thrilled you are here and we hope you'll take just a few minutes to learn not only about our incredible product but, more importantly, the mission behind it. Green Acres was founded over 50 years ago to provide services and programs for children with special needs. Today, LeSage Natural, a division of Green Acres, is the only bottling facility in the country whose sole purpose is employing and training people with developmental disabilities. To that end, regardless of the quantity, we do not refer to anybody who takes our water as a 'customer'. Far from that, you are considered a 'partner' in the truest sense of the word. Among all the bottling facilities throughout the United States and the world, LeSage Natural is definitely one of a kind. But our impact does not stop at the end of our driveway. In addition to providing employment at our own facility, our water, derived from our own deep-sealed wells, is transported to other similar facilities throughout West Virginia. Those facilities are then able to employ people with disabilities to distribute our water in those parts of the state, thus enabling even more job opportunities. Is all bottled water the same? Definitely not! Since 1991, a group of expert judges has convened every February in a small town in West Virginia at the largest water tasting competition in the world. These judges are faced with the daunting task of deciding what they consider to be the best tasting and highest quality waters in the world. The event, held in Bath (more commonly known as Berkeley Springs), has welcomed companies from 47 states across the U.S. and countries from around 5 continents (Argentina to the United Kingdom). LeSage Natural is a past recipient of the FIRST PLACE for bottled water! So, whether it's individual 16.9-ounce bottles or 3- and 5-gallon bottles, if you're looking for high quality and great tasting bottled water, the experts (and all our partners!) will tell you that you've found it! LeSage Natural has been internationally recognized for taste and purity, and it's sourced and bottled in just one place - Lesage, West Virginia.